Construction started at this location in 1882, with the dam going into operation in 1885. The wooden structure was replaced with concrete in 1904. 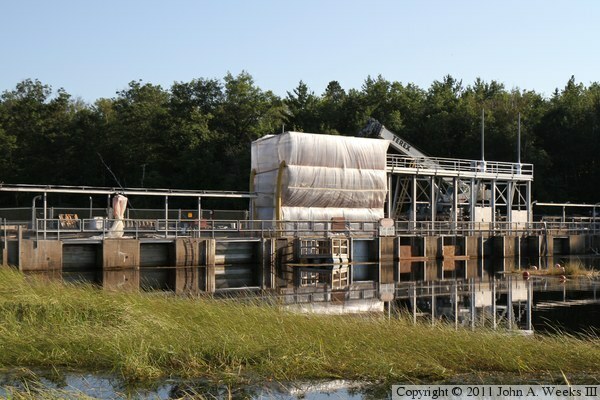 The concrete structure consists of 13 gates that are 8 feet each, and one 12 foot log sluice. 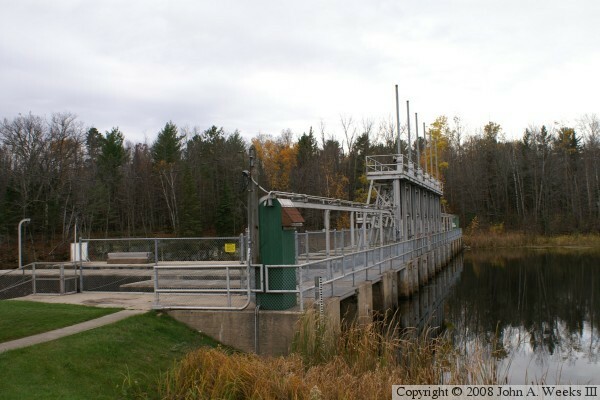 The main reservoir behind Pokegama is located to the south of the main Mississippi River channel. 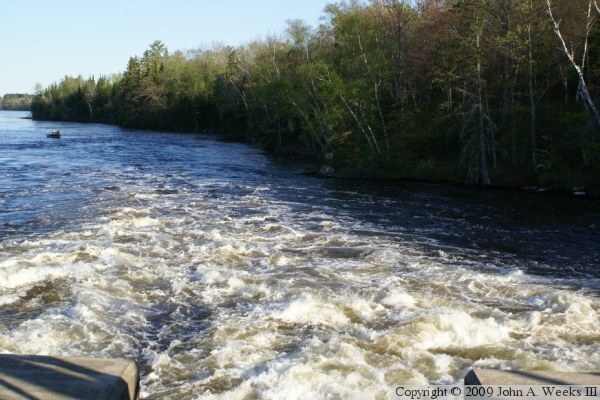 The Ojibwa coined the name Pokegama to mean the water that juts off from another water. Prior to the dam, Pokegama lake was mostly swamp described by locals as a vast region of wild rice. Below the lake was a series of falls. 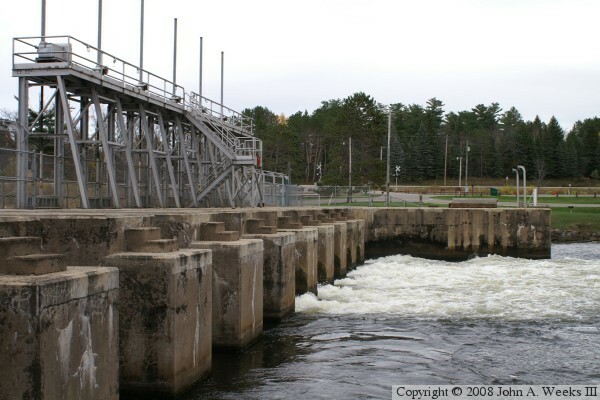 The Pokegama dam was built in a narrows just above a smaller falls. A larger 10 foot drop was covered with water when the paper mill dam opened just down stream. This area of rough water was known as the Grand Rapids of the Mississippi River. There is a very nice park and recreation area located around the dam. 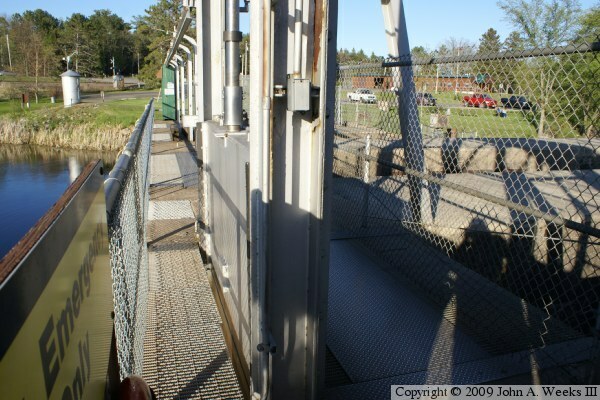 The dam itself has a walkway that is open to the public that allows you to walk across the river on the dam structure. 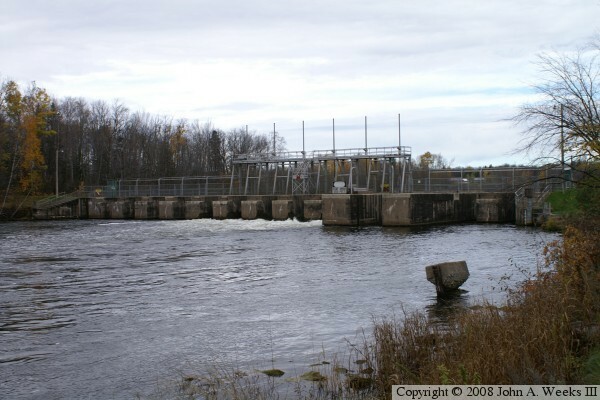 Update—the Pokegama Dam is getting a major overhaul in 2010 and 2011. According to the bid spec, this work is to include rehabilitation of six slide gates, removal of wooden stop logs, removal of the hoists and hoist enclosures, removal of lead paint, repair one abutment wall, and the construction of a new pedestrian bridge. The new pedestrian bridge will be a timber walkway placed on the downstream side of the dam. It will be supported by the concrete walls that separate the gates. The new walkway will provide excellent access to the trails on the south side of the river. The photo above is a view of the dam from the south end of the structure. All six movable gates are open to allow spring run-off water to pass through the structure. The photo below is a profile view of the dam site as seen from the parking lot. The BNSF rail bridge over the Mississippi River at Cohasset is visible in the background near the right edge of the photo. The photo above is the north end of the dam, showing the upriver side of the structure. 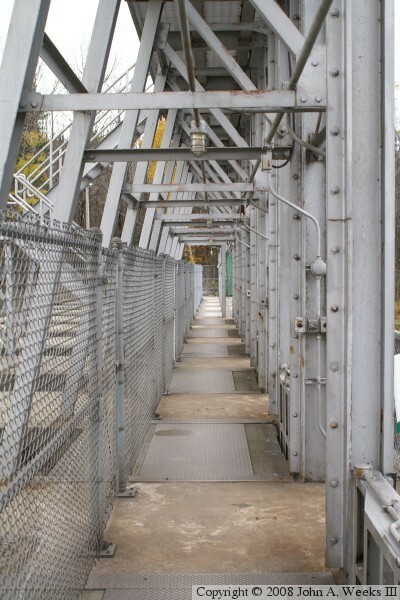 The photo below is a view looking down the pathway that crosses the dam. The steel plates on the floor cover the channels where water flows after passing through the gates. The gate mechanisms are located at the right edge of those steel plates. The photo above is a view looking down as water exits one of the 13 gates. The water is running fast and high due to spring run-off. 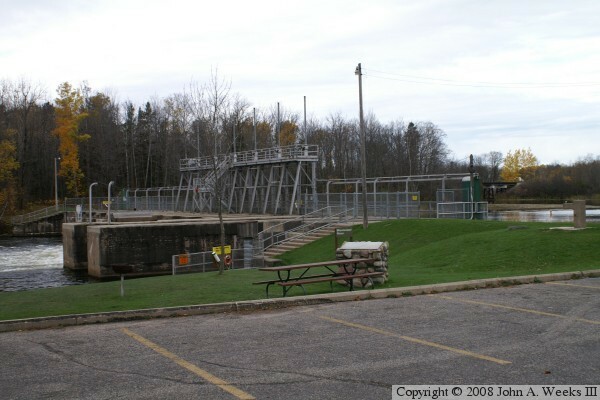 The photo below is the downriver side of the dam. 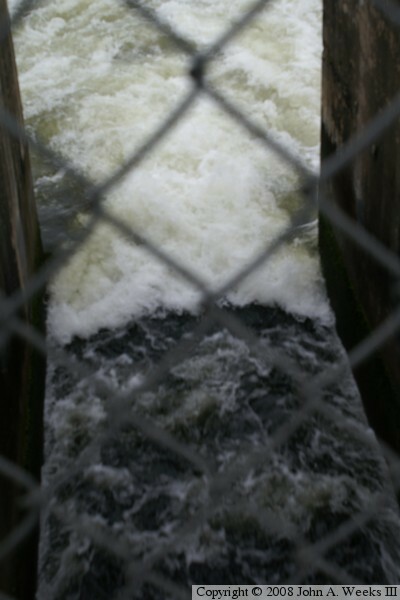 The photo above is looking downriver from the outlet of one of the control gates. The photo below is a close view of one of the control gates. A large metal slab is held in place by two vertical metal rails. A round shaft in the middle of the slab is connected to a mechanism above the gate that raises and lowers the shaft, which raises or lowers the gate. 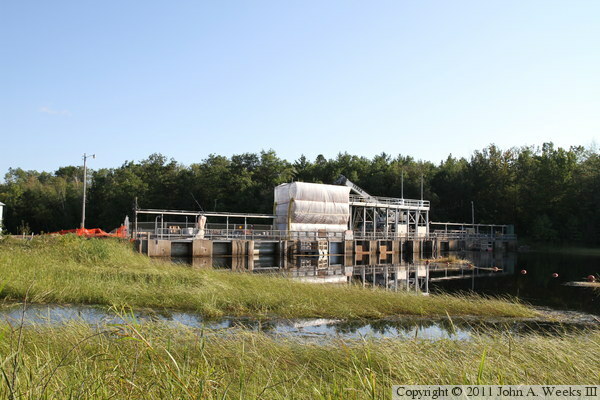 These two photos are late afternoon views of the construction work at Pokegama Dam as seen on August 21, 2010. The photo above is a wider shot, while the photo below is a closer view of the main dam structure. The area enclosed in plastic is covering lead paint removal work. It is very important to keep the lead paint debris out of the river. 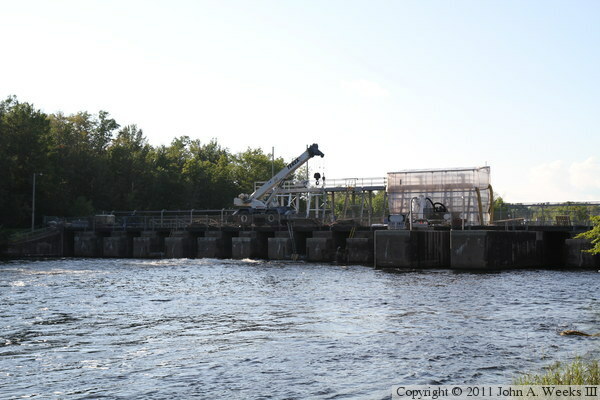 These two photos are looking west into the late afternoon sun towards the downstream side of the Pokegama Dam. The photo above is a wider shot, while the photo below is a closer view of the project. 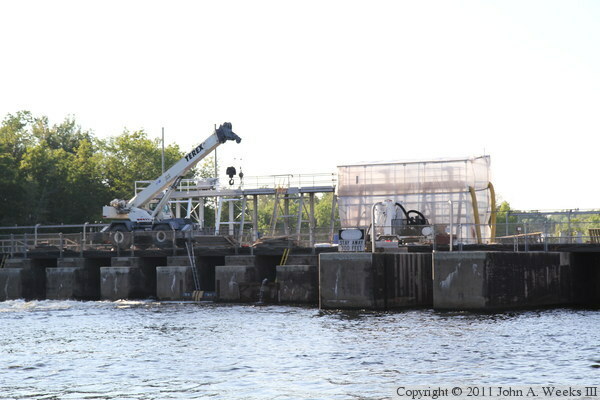 The small crane is supporting work occurring on one of the dam gates.